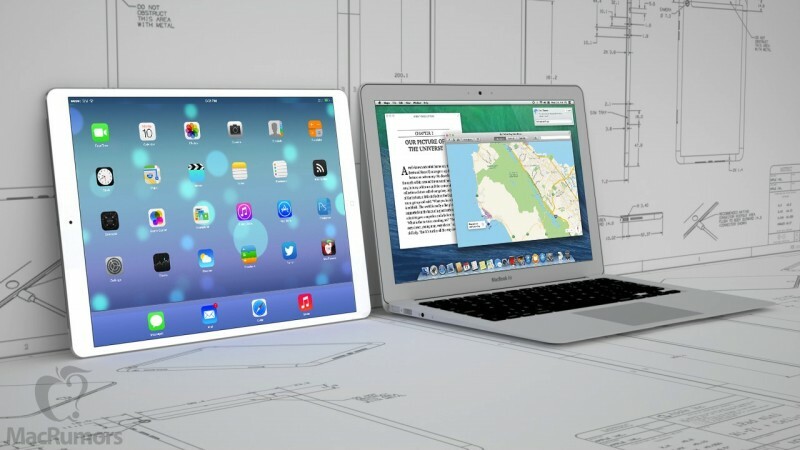 Following a report last month stating that Apple supplier Quanta Computer had landed the contract to mass-produce a larger-sized iPad for late 2014, Digitimes is reporting that the 12.9-inch tablet will be released in October 2014 and will target North America's educational market. Apple is also said to be examining the possibility of replacing the 11-inch MacBook Air with the larger iPad. Apple's large-size tablet will be manufactured by Quanta Computer, and was originally expected to adopt either 12.9- or 13.3-inch panels, with recent rumors indicating that 12.9-inch has a better chance to be picked, the sources noted. The report also states that Apple is planning to release a larger size iPhone in May 2014, using a 20nm processor manufactured by Taiwan Semiconductor Manufacturing Company (TSMC). Reports of a next-generation iPhone featuring a larger screen have surfaced occasionally throughout the past year, while the claim of an A8 processor made by TSMC is follows a report in June stating that the company had struck a three-year deal with Apple to produce A-series chips starting in 2014. However, a May 2014 release date for the next iPhone would be somewhat of a surprising move by Apple, considering that the most recent reports have stated that the larger-screened iPhone will debut in late 2014. A release then would be in line with the October 2011 launch of the iPhone 4s, the September 2012 launch of the iPhone 5, and the September 2013 launch of the iPhone 5s and 5c. A report last month from The Korea Times indicated that production of a 12.9-inch Retina Display to be used in a next-generation iPad was already underway at an Apple supplier in Korea, with a target date of early 2014. The larger tablet is also said to carry an improved display nearing ultra high-definition (UHD) quality, which would be significantly bigger and contain more pixels than Apple's current 9.7-inch iPad Air. Apple is also said to be examining the possibility of replacing the 11-inch MacBook Air with the larger iPad. Don't know about Jobs, but I wouldn't allow this. I still think this 12.9" device IS the new MacBook Air! If they don't release an iPhone with a larger screen this year I'll be jumping ship. Why you poor chap? Do you have bad eyesight? Or Giant pockets? I would be interested in the bigger iPad if it had true multitasking - opening two apps at the same time, side by side. I can think of few things more ridiculous than having a very large iPad using the exact same iOS as the iPhone, though (such as seen on the folders of the iPad under iOS 7). I don't want an iPad with the Mac operating system, but iOS needs many tweaks to fit better with a big iPad. Oh really.. what size issues exactly is that? My eyesight is quite fine and I need to cringe everytime I try to read something on my iPhone. Too damn small and it causes eyestrain for prolonged use. Ah, 'reports'. Trusty, trusty 'reports'. It's easy to guess. I wonder why all these publications never bother to acknowledge they are wrong when their guesses are wrong. Why wait if the larger screen is so important to you ? Oh yes....you are quite right.....because the only choice that matters is YOURS of course.....only YOUR choice matters. If the current iphone size fits YOUR needs then of course it is the ONLY choice. Because having more choices is bad unless they are YOUR choices right? If people don't agree with YOUR choice then you are going to belittle and make fun of them....because we all know only YOUR choice matters. Because I love Apple products. I have an iPhone 5s, iPad air, iMac and a mac mini. I love the Apple ecosystem. But I really do think it's about time they release an iPhone with a larger screen. Ideally I don't want to have to use Android just to get a larger screen. I want to use iOS on say a 4.5" screen. New iPhone in May is ridiculous, at least let people have the 5S for a year before it becomes "out of date". Will the 5s stop working in May?